Bristol Electronics installed our 20 panels quickly, efficiently, courteously, and just the way we wanted them. And our roof is a difficult one due to our post-and-beam construction. Nevertheless, the crew was friendly, informative, and just great people. Then even in the cloud cover, we began immediately to generate electricity! Furthermore, and most importantly for others deciding to install solar, the price was fair, competitive, and honest. If we had another home, I’d want them to put the solar panels on that one, too! 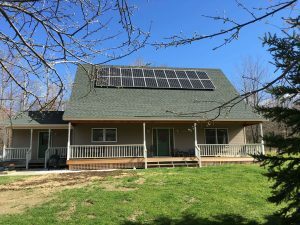 We recommend solar and Bristol Electronics without reservation!